If you own the Amazon Fire TV, you have a solid streamer on your hands. There are many ways to expand the media players capabilities, and we’re going to show you how to install Kodi on Amazon Fire TV stick today. What can the All-New Amazon Fire TV do? The all new Fire TV can stream in 4K with HDR, something the previous generations hadn’t quite mastered. That allows you to watch Prime content in UHD on your big screen in addition to pulling 4K media from sources like Netflix, Hulu, and VUDU. So why should you learn how to install Kodi on Amazon Fire TV boxes? Well, you don’t if you only want to watch those services and stay inside Amazon’s walled garden. If you feel adventurous or have a serious addition to streaming media, then Kodi is going to be your new favorite program. Kodi acts as a hub for all your streaming needs, including the aforementioned apps. It also allows you to watch free movies and TV shows from some unusual sources. Those would be Kodi addons, and we have guides to the best options available when you’re ready to go down that road. Our guide is for consumers with an Android smartphone or tablet. Kodi is lightweight and can run on most modern devices and plenty of older ones as well. If you do run into trouble with performance, you may want to consider a Kodi build which can help lighten the load in some cases. Installing Kodi on the new 4K streaming stick is just as easy as it is on the HD model. That said, there is a big difference. Programs like Apps2Fire currently don’t work with the 4K model. While that may change by the time you read this, for now, we are going to go with a program called Downloader. 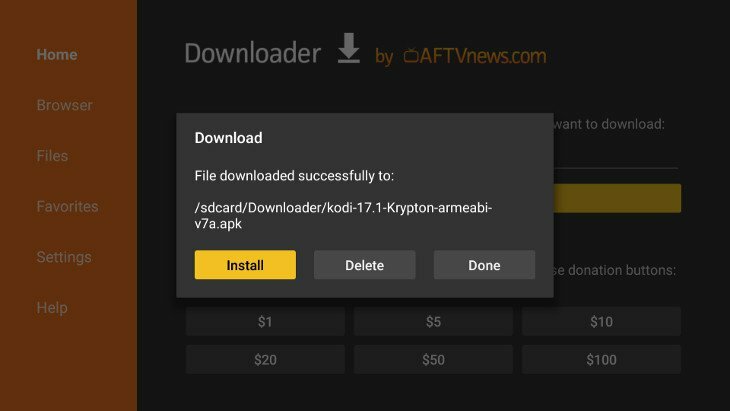 Before we get that app, you will want to enable your device to download Kodi. Thankfully, this is simple as you go to the Device tab on the Amazon Fire TV. From here go to Developer Options, and then click the tab to allow Apps from Unknown Sources. This lets our next program download Kodi directly to your device but also opens the door to potential hazards as well. You can turn this off when you’re finished but may need it on again if you plan on using visiting Kodi repositories frequently. Now, to get the Downloader app, you need to have an Amazon account. The official .apk is available from their app store and a very popular option. It is also the only way to quickly install Kodi on Amazon Fire TV without a PC. Once you have the free downloader app, you need to type in the URL of the file you want to snag. In this case, it’s Kodi, and the official site is the best way to roll. There are a few different ways you can go here, but you will want to select Android first, then either 32 or 64-bit. The former has been smoother in our experience but to each their own. There are many different versions of Kodi once you consider builds, but we are just dealing with the stock version this time around. After you select the one you need, it the program will start installing Kodi. It doesn’t take long, and then you’re going to have some tough decisions to make. The program itself is ready to roll straight away, and you can start altering the look of the program through skins and various other UI tweaks. If you prefer to dig a little deeper, you can go ahead and start digging around for add ons or set up the program to better suit your needs. We aren’t going to go too deep in that department, but we are going to talk about some tips to keep in mind when setting up Kodi for the first time. If you want to alter and adjust everything within the Kodi app, you may want to peruse our guide to Kodi settings. Otherwise, we’re going to keep this short and sweet by focusing on the key areas of Kodi. For most users, it will all start with the interface. You can access this area through the Gear symbol, which pulls up the main settings. From here you’ll want to select either the Interface Settings or Skin Settings depending on what you want to tweak. The Interface Settings menu in Kodi allows you to change the Skin. This is the easiest way to alter the look of the program, and it can be quite dramatic. Estuary is the stock skin with Kodi Krypton and a solid choice. That said, there are hundreds of other options available through official and unofficial repositories. You can spend a considerable amount of time digging through different skins as there are some amazing options out there. A few of our favorites included with Kodi are Confluence, fTV, Metropolis, Nebula, and Titan. Those are just a handful of what’s available out of the box so to speak, and you can access more through other repositories. You can also tweak regional settings from this area, set a screensaver, master lock or even turn on RSS newsfeeds. The Skin Settings section isn’t as deep although you can adjust sections that appear on the home screen in Kodi. As Kodi is a streaming media player at heart, you will want to dig into the Player Settings and Media Settings. With the former, you can do everything from enabling HQ scalers to setting up skip steps. Want to set DVDs to play automatically? That’s easy for Kodi, and it can also load up info from those antiquated CDs collecting dust in your closet. Other sections that you can adjust include Music, Discs, Pictures, Language, and Accessibility. The Media Settings covers the same basic areas but throws Libraries into the mix. This is where you can set access to your media folders for music, videos, and photos. It’s also where you can clean things up or set split videos to play as one. That’s key if you have larger media files that have been split, and a great feature to have on hand. Now that you know how to install Kodi on Amazon Fire TV, there is a world of media at your disposal. That includes local media you can stream from your network and free movies and TV shows through Kodi add ons. Keep in mind; this guide is geared towards putting Kodi on Amazon’s steamers, the 4K model in particular. If you’d like to install Kodi on other devices in your arsenal, be sure to check out our main guide on Kodi 17.6 Krypton.